Criteo Mobile, Banner advertising network details. Criteo’s high-end technology is trusted for our ability to re-engage online e-commerce sites with potential customers. We have remarkable figures that can impress any customers: 600TB Shopper Data per Day, 1.2 billion Shoppers per Month, $600 billion Commerce Sales per Year. Customers have an in-depth understanding about shoppers thanks to our shopper graph – our massive amount of granula data. We have the powerful engine designed to drive results, with three core components, including Kinetic Design, Product Recommendations, and Predictive Bidding. A simplified, seamless and unified experience is offered to your online users, whether it is adtech, martech, or data and operations infrastructure. 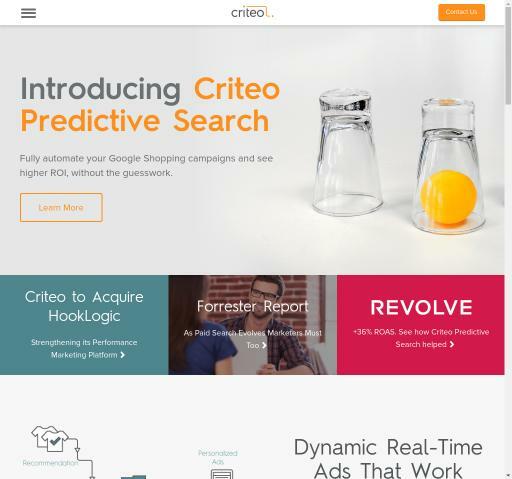 "Criteo's advanced technology enables online e-commerce sites to re-engage with potential customers who have left their website via dynamic banners containing the most relevant product specific recommendations that are generated in real-time for each individual." You can check Criteo reviews on Affbank and ask Criteo Team any question by using the contacts above, especially about how to earn money!